We appreciate the support and feedback from all our dogs and are very fortunate for the loving homes they now work for. Molly is from a 2nd mating of Ohutu Ace and Bonnie Lass. This little lass was born 1st Feb and went to NSW to live. As like the first mating the combination of these 2 talented dogs has again produced good working progeny. I wanted to let you know that Kaden's Molly has made a start on sheep at 16 weeks. Early days but she is balancing the sheep to me from the outside of a small pen after a couple of sessions. She's also had a few goes in the open paddock and she is definitely thinking, has the beginnings of flanking and getting around to the head. She's switch-on and confident but I'm cautious about going further until she is stronger and faster. Anyway first indications are very positive. (There was never much doubt because she was standing on the fence growling at our ram across the paddock the week she arrived). She has settled in well and is getting along with our older dog. Third jabs were 2 weeks ago and at that time she was 9kg. She is quick with learning things from context but still determined to get things her way if she can! She was answering to her name when she arrived so many thanks for putting that work in. She was turning into a little terror wanting to chase roos but is now doing credible sit-hold-release and has the beginnings of a stop at about 30 feet when we are out walking. She's sweet when she is sleepy and happy for a cuddle if anyone's offering! Thank you for this great little girl. I hope that things are going well at your place and the dams are holding up. Kaden's Jewel, 10months, is a beautiful female from Ace and Bonnie Lass's litter, she sounds very similar to the one I kept Karma. This litter has developed beyond anything I have breed in the past with all pups working and working well. They have all shown a high work ethic and natural ability. I am very happy with this cross.I have also been fortunate that the pups have gone to good handlers and homes. Hope your doing great. Sorry to see Ace has been injured. That must of been very hard. Pleased he is on the mend, Here is to Ace having a full and speedy recovery. Hope I have not sent too many photos for you. Let me know if I have, for future reference. i don't have any photos of Jewel doing work. will try to get some for you. Jewels is a wonderful dog. Both at work and at play. We are very happy with her. She has won my husband over. 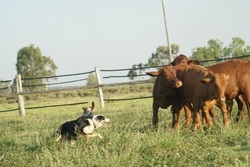 She's become his dog when cattle work is on. She is very quick to establish eye contact with cattle. She generally wants to take the lead, is gentle - have not seen her bite, and adjusts her approach based on what she is dealing with. She will take quite different approaches to a bull, compared with a sick calf. She is very quick over the ground, and has a strong work ethic. She is also very responsive. She takes work very seriously, and is very focused. She covers a lot of ground. She is very playful, boisterous, and has a great personality. She wants to please you. She treats food more as a toy or game than something to eat. So her jealous nature, is very helpful when feeding her. She has matured a lot mentally in the last couple of months. Kaden's King is another Ohutu Ace X Kaden's Bonnie Lass pup. He was sold to Russell Young, who has done a wonderful job with him. King was a big bouncy pup who loved his food. King was around 7months when this email was sent. 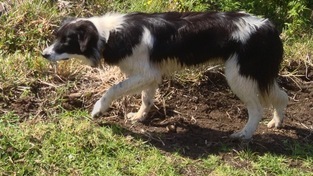 King is without a doubt the most natural intelligent working dog I've had anything to do with. I cannot say enough good things about him. I will email you some photos of him working weaners. He is a big pup and still growing more everyday. He works and handles weaners alone now in the pdk and in the yards and improves every time. He just finished his first solid month. I will only use him lightly now until Sept. As I don't want to over do him in the first 12 months. 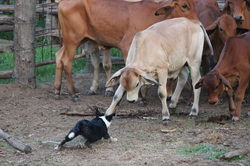 When I let him out of the Kennel you have to keep an eye on him because the mom he gets board he will go find a mob of weaners in the house pdk and deliver them to the front gate of the house. I was just looking at your site and I see you are crossing Jack and Faith. I was wandering if I could give you a deposit for a pup of that litter. I am only interested in a female though. Kaden's Zeus is Ohutu Ace and Bonnie Lass's pup. At 8 weeks of age, he went to Ryan Jenkins down in NSW. Ryan is at the moment training Zeus at his local herding club. Here is an email he sent me on his progress. Zeus was the smallest pup in the litter and I was very cautious on who was to take him. Ryan has done an excellent job raising Zeus. Hope you and the dogs are well. Sorry for taking some time to get you a email to you, life has been nonstop here, now things have started settling down. So I attached a couple of pictures of Zeus to the email. He has grown a lot, probably not to the extent he should be but he is getting much bigger. He does have huge paws which is a great and people have commented saying he will be big. 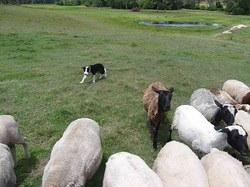 I have taken him to a sheep dog club a couple of times and I can tell you people have been very impressed with him and asked after where I got him from and his lines so who knows maybe in the growing months some people down here will get in touch with you. Zeus is a very sensitive dog, the couple of times he has seen sheep I barely have to motion and he is going the other way. He likes being up close on the sheep and is really strong and not scared at all. It will be very exciting when he gets older. Hope your all doing great and I’ll keep you updated over the coming months. Kelpie is another of Bonnie X Ernie pups. I sold her at 8 weeks to Alex Rudd. Alex has done a wonderful job with Kelpie and I have posted a story he sent to me about her. You can tell Alex has got Kelpie and her partner, Buddy working beautifully together and I think there wouldn't be anything this team couldn't do. As a breeder I am so pleased to see my pups reach their full potential and they can only do that with good trainers like Alex. It''s raining here at the moment, and today turned out to be one of those day that you live for. 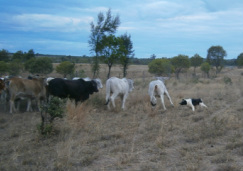 I had to move some cattle that the owners have not been able to yard, although they are quite and had some dog handling, are very spoilt, I sent you a photo in my last email of Kelpie in the Rhino, the hills and scrub you see in the back ground is where the cattle were. than to say that the cattle appeared, out of the mist and rain in the gully, 20 or so min/ later. For me it one of those things I won’t forget for a while, it was a clean muster, the dogs had to do some good work to get them through the gate, 90% of the credit has to go to Kelpie for her intelligence, the old dog Buddy is the mussel. Betty is a one of Bonnie Lass and Barcoo Ernie's pup. She was sold at 7 weeks to Pip Flower. Here is what she said about Betty's progress at 4 months old. Hi Denise, Pip here - I bought the 'Pretty One' pup from you. She was the second last to go from Bonnie's litter earlier in this year. Anyway, thought I'd email you to let you know how she's going. We named her Betty by the way and she is an absolute delight! From the start she learned things incredibly quickly; Sit, Lie Down, Stay, Up, Hop Down. I've never known a dog like her, one so intelligent and loyal. At first she wasn't terribly affectionate and didn't appreciate any pats or cuddles. But she's more agreeable now, haha. And is always staring and watching me and following me everywhere! Recently i've been taking her to the yards (where we have some weaners) to see how she gets on. We haven't acquired any Dorpers yet, but looking into it! She's been doing really well there, she was nervous and uncertain but watchful in the beginning and now, today, she did immensely well; always looking to please and perform. The weaners haven't been around dogs before but she is certainly giving them a run for their money! Zoom is by Barcoo Ernie out of Bonnie Lass. She is 6 months old here. Boss was a going dog when Jacqui took him over. He is Bonnie lass's brother.